You Are The Roots: almost but not quite yet one. almost but not quite yet one. My husband keeps saying that we have a one-year old. I'm quick to correct him because, well, my baby isn't one until tomorrow. I'm clinging to his fleeting infancy with everything I have. Right now I'm a good mix of denial and tears. We'll see how I do tomorrow on Ethan's actual birthday. Gosh. His birthday. It can't be! ...and life kind of sucked. This time last year, I was one day away from having my water break all over the guest bathroom of my parents house while my fifteen year old sister looked on in horror. I can't glamorize it. I'm glad it's not this time last year. So even though I'm a mess over my baby turning one, it's a better kind of mess than I was this time last year. This year, this week signifies so much more than swollen ankles and heartburn and waking up to pee 4,000 times per night. 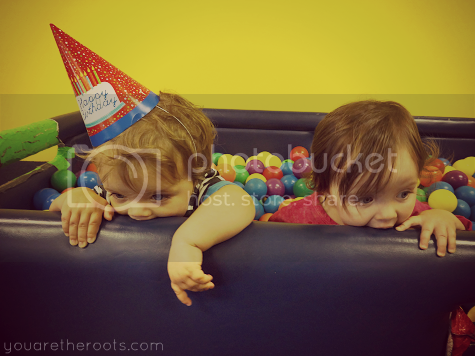 This week signifies my baby turning one and that means time for fun! I've been busy packing a ridiculous amount of fun into each and every day this week. Grocery shopping? Perfect excuse to wear a birthday hat and dance down the aisles. Our mommy and me class at My Gym? Time to party! 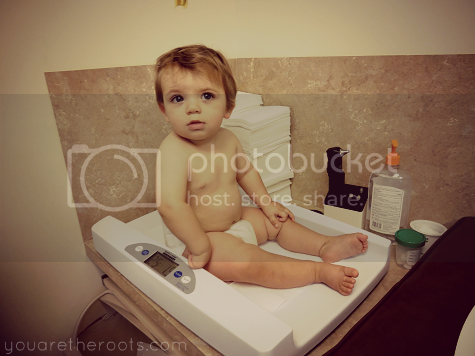 Today was Ethan's one year check-up at his pediatrician's office. He wore the "birthday boy" ribbon I had found at Target earlier this week. 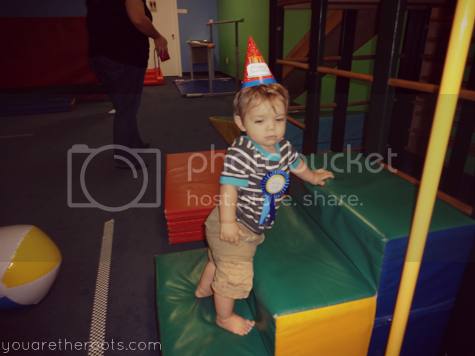 On the elevator ride up to the 2nd floor, the other passengers in the elevator broke out into song, singing "Happy Birthday" to Ethan while he stared at them with his typical serious face. My little boy? My baby? He's in the 81st percentile for height and the 80th percentile for weight. As if I needed another reminder that my itty-bitty little baby is about to explode into toddlerhood. Our week of fun continues with a ravioli lunch (Ethan's favorite) and a trip to the bookstore to play with the trains. And somehow, someway, my baby is going to turn one tomorrow -- but I can't think about that yet. Not yet. Ethan your ONE tomorrow!! Happy early birthday to you! Linds this time this year seems like it is much much better for you than last, I didnt know your water broke! that must have been a rush, haha, get it? 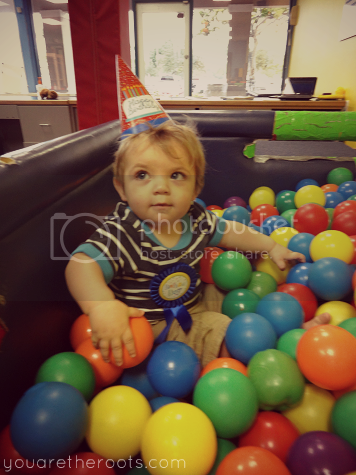 Ethan is so cute, and I cant wait to see his awesome birthday pics!